I would love to have my sister Kellie and her partner Katie over for all of our wine tastings, provided they bring the ever adorable Elliot with them. Unfortunately, they live in Chicago. For Christmas I decided I would send a tasting to them. It's against the law to send wine through the mail, so I had to buy it from somewhere that could ship it. I chose K&L, my favorite local shop. I was somewhat constrained when I chose the wine. I wanted them all to be from different regions of California and new to me. An additional complication was they all had to be found in the main warehouse of K&L so they would go out in one package; paying for shipping is bad enough once. I considered doing a skype tasting, but Katie said it usually takes them a week to get through a bottle, so they would need help getting through 4. A skype tasting with just us would have been pretty geeky, but with others it would probably have been a tad strange, so we decided to taste separately and share the results. We invited Ted and Shannon, and Bob and Carolyn over. I prepoured the wines. It was my first chance to use the new slate cheese plate and cheese knives I received for Christmas. 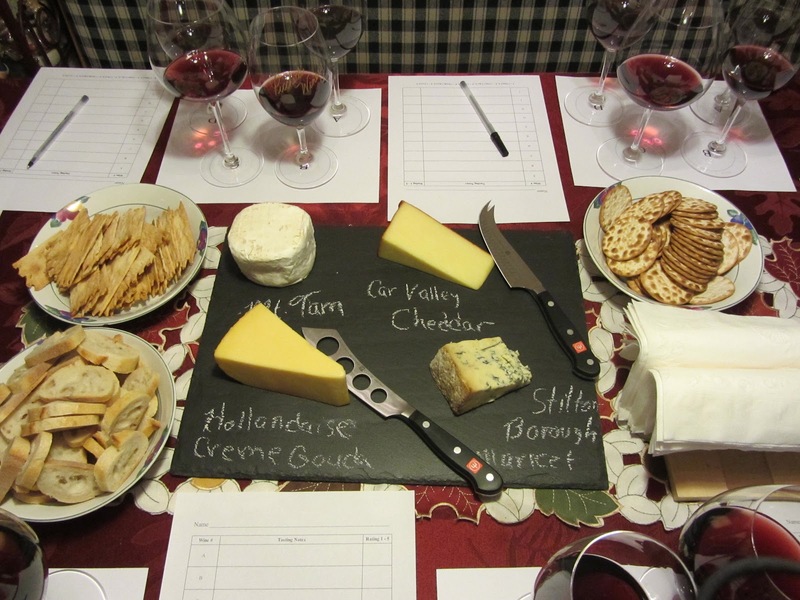 The plate allows the names of the cheeses to be written on it. It rocks. Thanks Sue! The cheese knives are just too cool and much too exorbitant.Thanks mom!, you shouldn't have. We tasted the Pinots, sharing our thoughts as we enjoyed each other's company. After tasting, we enjoyed a great meal of seafood enchiladas and chicken nachos. 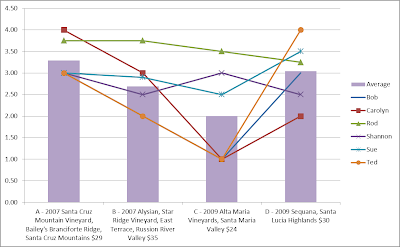 A - 2007 Santa Cruz Mountain Vineyard, Bailey's Branciforte Ridge, Santa Cruz Mountains came in first with an average score of 3.29. It cost $29. D - 2009 Sequana, Santa Lucia Highlands came in second with an average score of 3.04. It cost $30. B - 2007 Alysian, Star Ridge Vineyard, East Terrace, Russion River Valley came in third with an average score of 2.69. It cost $35. 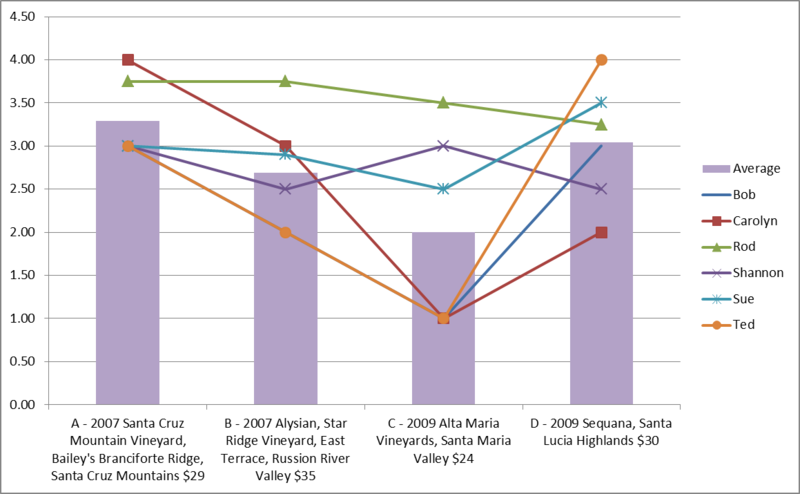 C - 2009 Alta Maria Vineyards, Santa Maria Valley came in last with an average score of 2. It cost $24. Kellie and Katie had a great time. Apparently they stayed up until 2AM for the first time since Elliot was born. Burrell School's club delivery coincided with the grand opening of Odonata's new tasting room. 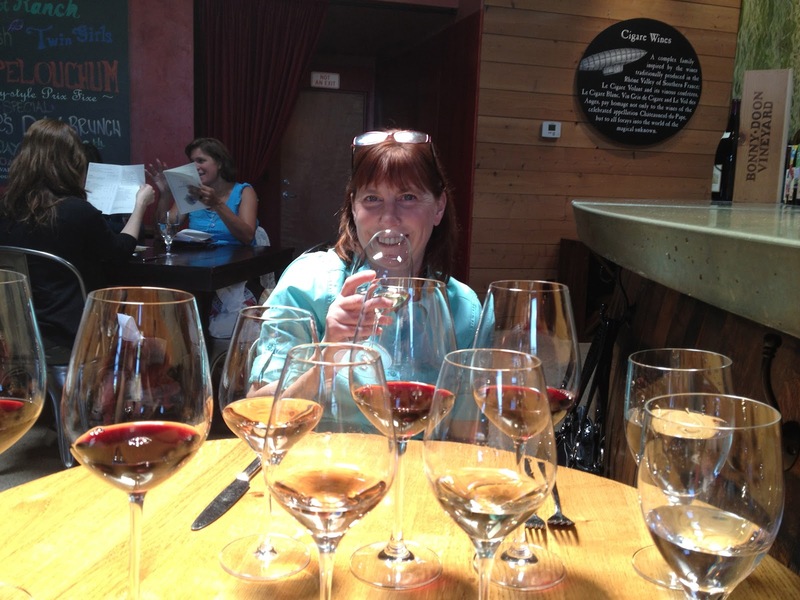 Sue and I had briefly tasted Odonata's wines, what little he had left, on our first trip to the Surf City Vintners. He seemed like a really nice guy, making some good wine, so I thought it would be good to patronize his new place. We arrived in Santa Cruz 45 minutes before the tasting room opened. Walking by we could see them furiously working to get everything ready. We asked if they were ready for business, but they said come back at noon. We picked up an apricot and dark chocolate chip scone and a chocolate croissant at the bakery next door, you can guess who got what, and went for a walk, enjoying the beautiful day. Has Kyonghee convinced Bob to sideline in the Coffee business? Arriving back at noon we found we were not alone. Four other couples were waiting for the tasting room to open. Eventually someone walked in. 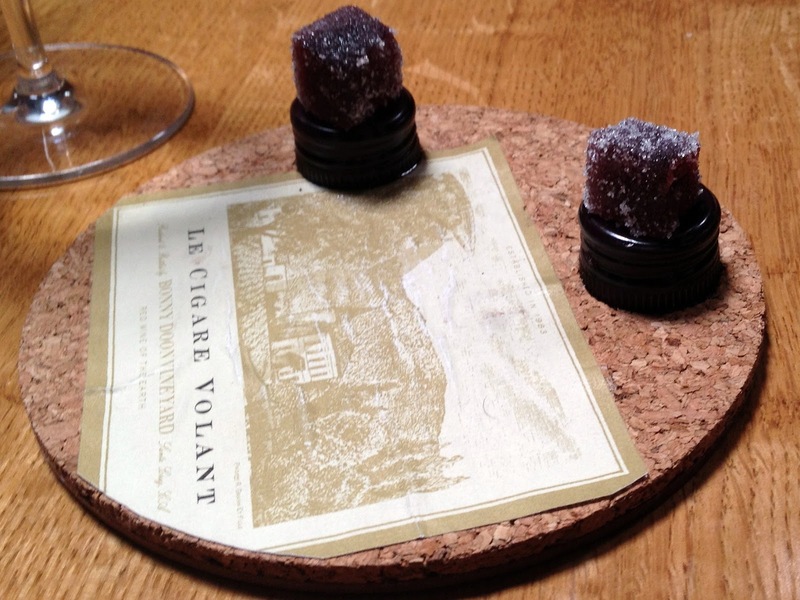 We followed, paying our $5 tasting fee. We were then greeted with a refreshing glass of River Skimmer, which sounds a little scary, but was very nice. As we enjoyed the wine, Denis Hoey, the owner and wine maker said hello, thanked us for coming, and told us all about the place. He looked a little frazzled, but very proud. The tasting room was very nice, with plenty of room inside and out to enjoy their offerings. The walls were lined with paintings from local artist John Crawford. Denis said that they planned to rotate local artists every month. All the furniture was antique, furnished by Crawford Antiques. Using local talent was very important to Denis, even the pitchers were made by local glass blowers. There was a huge table of delicious cheese and wine food of all sorts. The wine was very nice. We brought home some Pinot and Malbec. I also picked up one of their t-shirts, which has a cool tribalized dragonfly on it. Like any urban tasting room, it doesn't have the scenic views of the mountains, but if you're looking to taste some good wine in a nice location, Odonata is an enjoyable, worthwhile stop. 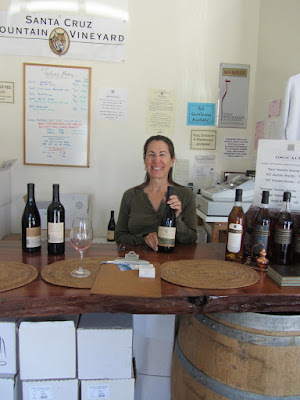 We had lunch at the restaurant in Bonny Doon, Randall Grahm's winery, which is just a block away at Surf City Vintners. I didn't know what I had gotten myself into until I looked at the menu. This place was a foody/granola lovers dream. Thank goodness there were a few meat choices on the menu. I went with the pork shoulder sliders, which I didn't know were even sliders until they showed up. 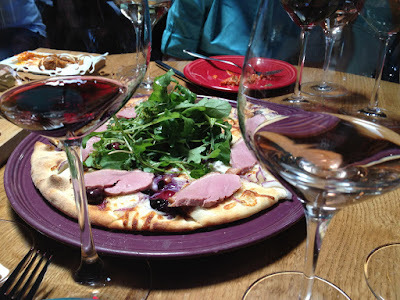 Sue had an onion, duck, blueberry pizza (that must give you ideas of what they menu contained); the center was covered in an arugula salad. They were both very good, though I'm embarrassed to admit I couldn't bring myself to try the blueberries, and, of course, I never even considered trying the salad. In addition to the food, we ordered the Flight of the Cigare for each of us, which included 4 2 ounce pours. Sue and I agreed the best of the batch was the 2011 Vin Gris de Cagare, which was a refreshing rose of sorts. Neither of the reds seemed to have much going for them, they were pretty bland. Since we were there, we decided to go around the corner and knock another winery off our list: Santa Cruz Mountain Vineyard. The tasting area was pretty industrial, but nice enough. The wood of the bar was pretty cool, made from a tree off the wine maker's parent's property, if I recall the story right. The staff was very friendly as were the other patrons. We had a good time jabbing about this and that. I lamented with a Florida State fan about rebuilding years, perhaps even decades. Unfortunately, the wine was hit or miss; nothing really stood out. We took home their two Pinots and a Tempranillo to explore further in the future. Their Bailey's Branciforte Ridge Pinot won an as of yet unposted blind tasting, though it was not tasting that today. We packed up the wine and headed to Burrell to enjoy the sun at the summit.